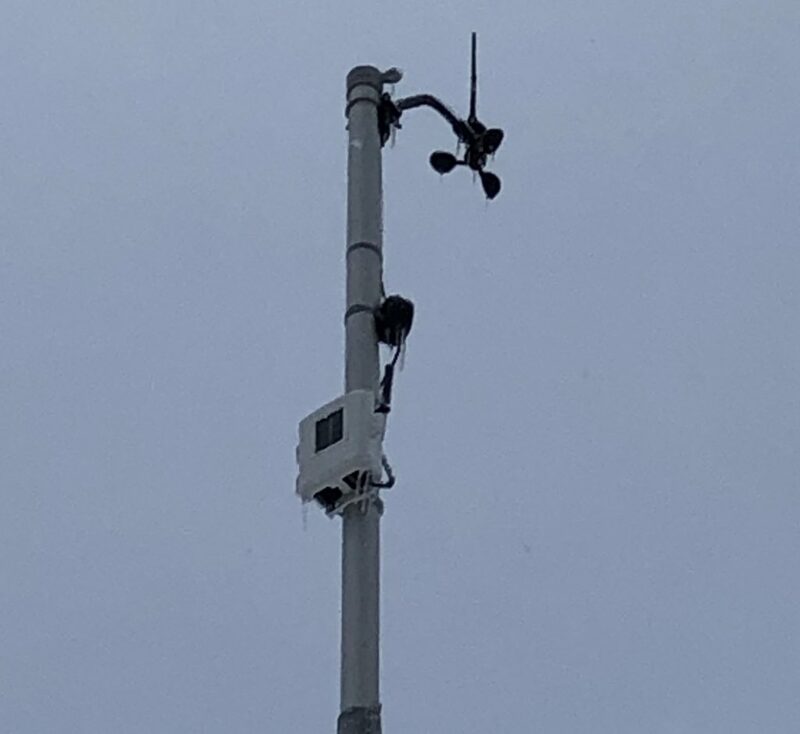 February 5, 2019 February 5, 2019 by John W.
Like every other object in its path, Monday’s ice storm did a number on our anemometer (wind gauge). The pole to which it’s mounted cannot be retracted because… you guessed it. So nothing can be done but wait. It’s going to take either a big gust of wind (> 25mph), some sunshine and/or warmer temperatures to free the spinning cups. Until then, wind speeds will read 0. With temps barely cracking 20 in the next 5 days, it might be awhile before it’s fixed. [UPDATE 2/5/19 6PM]: High winds forecast for Thursday may provide sufficient energy to loosen the ice. Fingers crossed. The directional indicator is currently turning as it should. So if you see “N”, that means winds are coming from the north. Just FYI, the National Weather Service says this is only the 2nd time in the 2000s that an Ice Storm Warning has been issued. It’s just not something we are accustomed to up here. That’s doubly true for February. We got about an inch of freezing rain out of that storm! I love this site. No searching for e. g., snowfall data, etc., as it’s all handy dandy. Marquette data too, not KIS. John, keep up the good work. Find a politician (most any will do) with hot air to thaw your anemometer. Thanks, Joe! Everyone who enjoys fishing should check out Joe’s great local website: Joe’s Lake Superior Fishing.